The return of NFL football kicks into full gear this week and the action continues with a battle between the Denver Broncos and the Chicago Bears. Preseason games are a time for teams to find out exactly who will be playing for them, whether it be specialists, rotational guys, or full time starters. Below, PFF’s team of analysts have all the most important position battles and players to watch during today’s game. Perhaps the most important position battle for the Broncos, the competition between Trevor Siemian and Paxton Lynch will be one to watch in this first preseason game against the Bears. Both quarterbacks saw the field in 2016, with Siemian playing in 14 games (895 snaps) and Lynch playing in three (177 snaps). Both players graded poorly last season, with Siemian earning a grade of 56.2 and Lynch a grade of 44.7. Of the 43 quarterbacks with at least 80 drop backs, Siemian ranked 31st in adjusted completion percentage (70.0 percent) while Lynch ranked 42nd (65.8 percent). 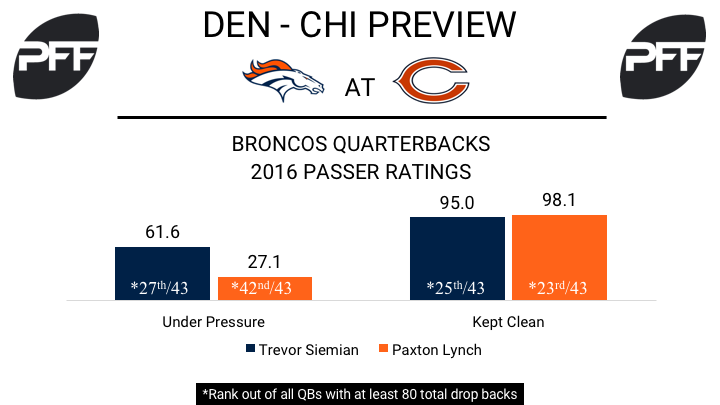 While Siemian (61.6) was just below the NFL average (64.6) for passer rating under pressure, Lynch struggled under pressure in 2016 with a passer rating of just 27.1, though on just 22 pass attempts. When kept clean, however, Lynch had a passer rating of 98.1, three points higher than Siemian. While OLBs Von Miller and Shane Ray will likely open the season as starters, 2017 second round pick OLB DeMarcus Walker should have plenty of chances to rotate in this season. The former Florida State defensive end accumulated 63 total pressures last season, ranking eighth in the FBS among all 4-3 DEs. Not just a one dimensional player, Walker also had 27 run stops, third most in the FBS in 2016. The Broncos drafted T Garett Bolles out of Utah in the first round of the 2017 draft, and it appears that he will open the season as the starting left tackle. Bolles earned an overall grade of 86.0 last season, and he shined as a run blocker with a run block grade of 89.9, fifth-highest among all FBS tackles last season. The rookie should see some reps against promising Bears edge rusher Leonard Floyd, who had five sacks rushing from the right side last season. WR Carlos Henderson out of Louisiana Tech tied for the most touchdowns by an FBS wide receiver last season (19). On the Broncos first depth chart, the 2017 third round pick is listed as fourth string at one of the receiver spots, but we could see him move up prior to the start of the regular season. He led all FBS wide receivers with 48 missed tackles last season, 22 more than the next closest receiver. The Bears are still trying to figure out who is going to start next to Quintin Demps, the veteran free agent they signed this offseason from the Houston Texans, and they have a trio of young safeties all competing for the spot. 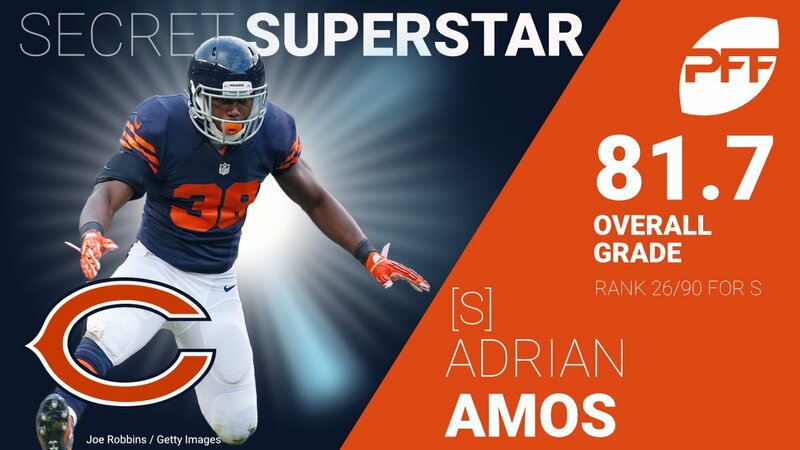 Adrian Amos played the most snaps of any Bears safety last season (938), and he enters 2017 as an underrated player to watch in the secondary. 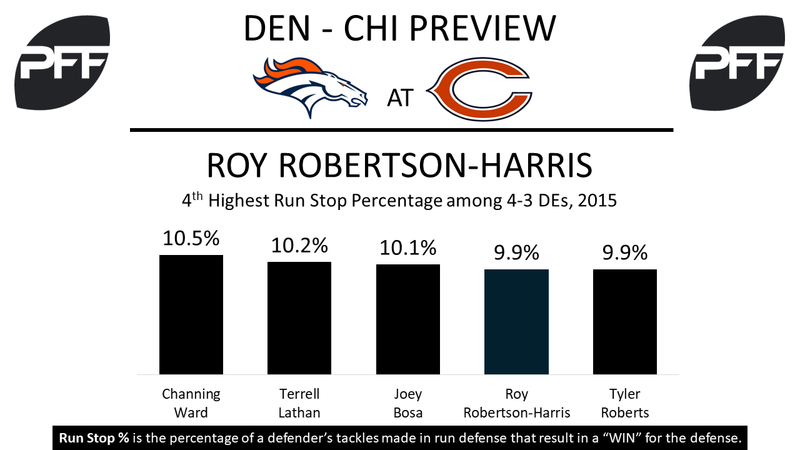 The team also returns Harold Jones-Quartey, their other primary starter at safety in 2016. Both players allowed a passer rating in coverage of over 125.0, but some of that was scheme related as they both averaged less than 11 yards per reception allowed. The Bears added Alabama’s Eddie Jackson in the mix in the fourth-round of the draft, a converted cornerback who can offer some versatility in coverage. During his seven-game senior season, Jackson was targeted only 11 times and allowed a passer rating of just 38.8 in coverage, albeit in one of the nation’s most talented defenses. All three of these safeties are still under the age of 25 with plenty of room to grow. Amos is the returning favorite, while Jones-Quartey is dealing with an ankle injury, and the rookie Jackson has emerged in his place as a legitimate candidate to start in year one. A fan favorite at training camp, Gentry has developed a nice connection with Mitch Trubisky early in their careers. The undrafted rookie free agent excelled on the deep ball at Wyoming, leading all FBS wide receivers in deep targets (49) and deep catches (22) on balls that traveled more than 20 yards in the air. Keep an eye on Gentry and his rookie quarterback connecting on some long bombs. The Bears stashed Robertson-Harris on the reserve/non-football injury list last season as an outside linebacker, and he returned this year as an athletic defensive end to watch this preseason. He played only 25 snaps last preseason as an undrafted rookie free agent, but in his last season at UTEP, he was tied for fourth in his draft class in run stop percentage at 9.9-percent, among 4-3 defensive ends. Brown quietly played the most snaps of any Bears tight end over the final five weeks of last season, after joining the team in October off of waivers from the Baltimore Ravens. He caught 16 of his 20 targets, while making some nice blocks in the running game, and despite the additions the Bears made at tight end, Brown is in the process of pushing Zach Miller for a roster spot.